BibleX: Lightning or Lightning Bug? Mark Twain once intoned that “the difference between the right word and the almost right word is the difference between lightning and a lightning bug.” Bible teachers and preachers also know the importance and power of words. Indeed it is our stock-in-trade. But for some it is easier to turn a phrase in a sermon than it is to produce a timely word in a more personal setting. 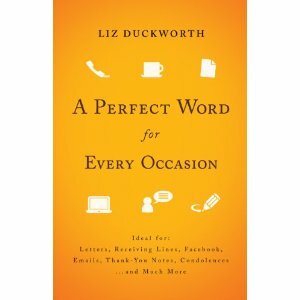 For those who struggle to find the perfect word on such occasions, Liz Duckworth has provided some help. 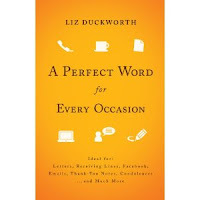 Her brief, easy-to-read book APerfect Word for Every Occasion supplies practical suggestions for finding just the right word for most commonly occurring occasions. The occasions addressed in this work include grief, gratitude, sickness, suffering, birthdays, weddings, engagements, encouragements related to personal setbacks, celebrations, events, activities, words of truth and love (i.e., apologies, confrontations, etc. ), and even a section devoted to using the right words in cyberspace. Each section typically includes guidelines for finding the right words, prompts to help you begin, words to make your own, a guide of what not to say, and quotes worth sharing. In general the author does a good job helping one find “apples of silver” (Prov 25:11). Not all the suggestions here are original, but even the familiar expressions seem to be appropriately chosen. At the end of the day, one has to own their own words for them to be authentic, but the author has given tangible assistance to those who are looking for the perfect word, or at least a better word, for those day-to-day opportunities to minister through one’s words. A free review copy of this book was provided by Bethany House Publishers.